As with several of the other major pairs the dollar to cad was a beneficiary of the market’s return to the US Dollar as equity markets suffered as a result of the dreadful NFP data in the US which fell below market expectations, taking the US unemployment rate to almost 10%. 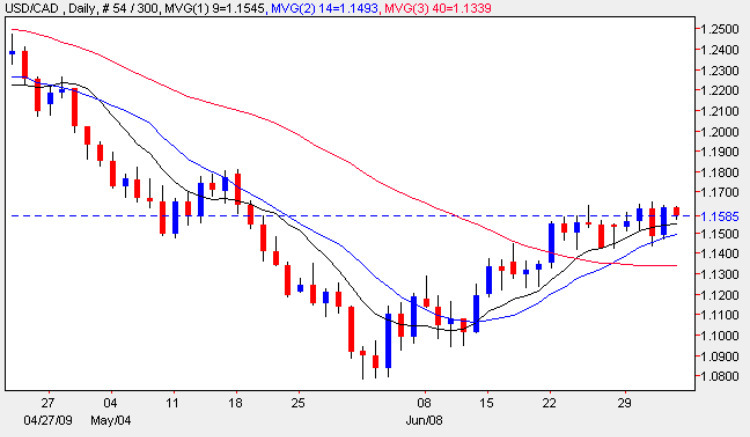 The daily candle closed as a wide spread up bar finishing the session above all three moving averages and finding good support from the 14 day. However, the high of the day failed once again to hold above the 1.165 region which is the fourth time in the last 2 weeks that this has occurred suggesting once again that this price point is proving a solid obstacle to any sustained rally higher. Only a break and hold above the 1.18 region will now validate the rally further and it would seem unlikely that we will have any confirmation today owing to the national holiday in the US for Independence Day, and we therefore need to wait until early next week for any further signals as to whether this trend is likely to stall or will find some fresh legs from renewed Dollar strength.